While obviously most of the action at Fujirock goes down within the festival gates, or just outside them, there are a few amenities that the usually sleepy Naeba town can offer during your festival experience. Home to a large selection of traditional inns, hotels, and souvineer shops, this little town is worth a stroll down the main drag at the least. One of the main attractions to festival goers here is the natural hot spring that can provide relief from trudging the festival grounds all day. 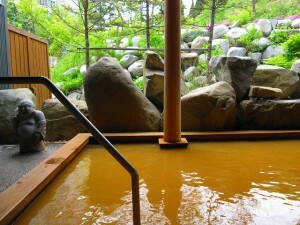 Yukisasa-no-Yu is a hot spring which can be reached by a 10-minute walk from the festival gates, right along the main street in central Naeba. The facility has both indoor and outdoor baths for males and females each, and a large room for relaxing post-soak. For those of you not familiar with Japanese public bathing culture, you may want to read up a bit on the manners and do’s/don’ts before entering, but as long as you remember to wash your body completely before entering the bath, everything else pretty much falls under common sense. The best part here is that due to large crowds in Naeba during Fujirock, Yukisasa-no-Yu extends their hours to remain open around the clock. 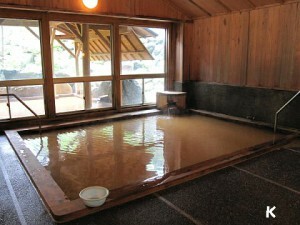 This means you can enjoy a hot spring bath at any time of the day or night. One tip though, you may want to avoid peak hours in order to get the most relaxation time for your money. Entrance to the bath is 900yen for adults, 400yen for children, and there’s a couple’s discount (though you can’t bathe together) for 1,600yen per couple. The bath also has towels, shampoo, hair driers and other toiletries for rent if you need them. A small price to pay to recharge after a couple nights sleeping in a tent or a day trudging around with soggy boots!